Use Predefined Views or Custom Views to see issues. Predefined Views displays information such as All Issues, Not Assigned, Overdue Issues and Issues from Zoho Desk and so on. Create Custom Views for issues based on your business requirements. To add, edit, and delete issues from List View refer, Manage Issues. All Issues: View all issues reported in the project. All Open: Open issues are displayed for the selected project. All Closed: View issues that have been resolved in the project. My Open: View Open issues assigned to you across projects. My Closed: View Closed issues assigned to you across projects. Not Assigned: View all issues that are yet to be assigned to an owner. Overdue Issues: View issues that have missed their deadline. Created Today: View issues submitted on the current day by all the stakeholders. Issues from Zoho Desk: View issues that are reported from Zoho Desk. Zoho Desk must be integrated with Zoho Issue Tracker. Click Issues from Zoho Desk. Escalated Issues: Issues that are escalated based on their SLA. Click and choose the Export Issues option. The issues are exported in xls or csv format. You can also choose to export issues with Comments and Description. Zoho Projects allows you to import issues from other issue trackers into Zoho Projects. But, before importing into Zoho Projects, you must first export the data from the other issue tracking system is in the desired file format and then import the file into Zoho Projects. The supported import file formats are CSV, XLS, and XLSX. Click and select Import Issues. Click Choose File and select the required file extension to import and then click Continue. You can import CSV, XLS, and XLSXfiles. 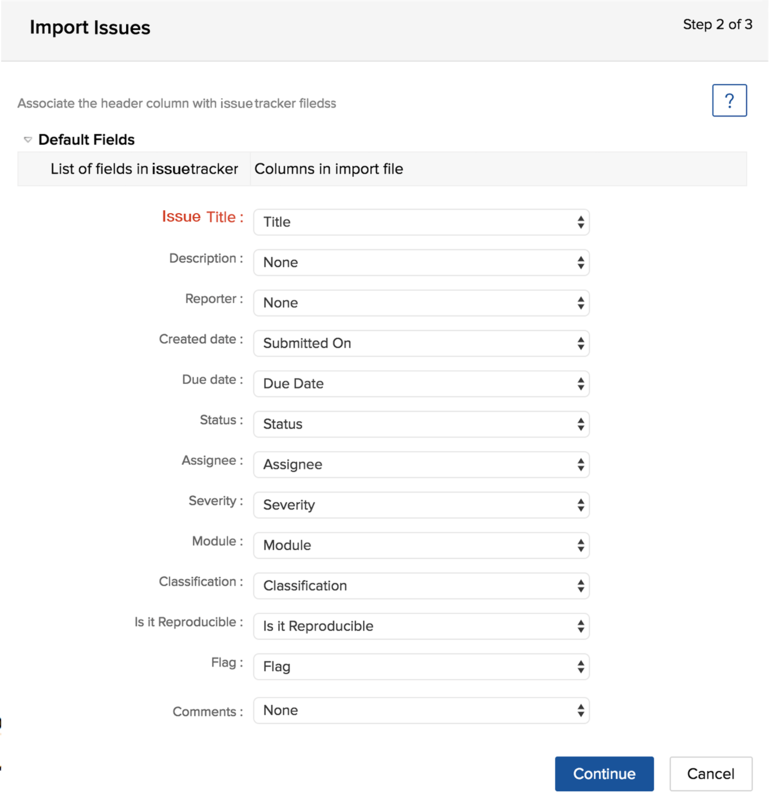 Map List of fields in Issue tracker and Columns in import file. A warning message is prompted if you select the same column value for more than one field. Select the desired date format. Click Continue to confirm the file import. Isseus are displayed in the List view. A notification about the import is also mailed to your inbox . You can import files only in CSV, XLS, and XLSX format. You can customize columns in the issue List view based on your preference. Click and choose Customize Column. Select Default View or Compact View. Compact View shows more issues than the Default View. Select the desired columns to view. You can also clear the columns that are already selected, if you do not wish to view them in the List view. Only the selected columns are displayed in the List view. You can expand and collapse the issues view. The expanded or collapsed view remains saved even after you navigate to another view and come back to this screen. You can sort issues based on their Created, Modified, Last Closed, and Due dates. You must click the arrow in the selected column to sort issues in ascending or descending order. You can update issue details such as Browser, Assignee, Due Date, Status, and others for multiple issues with one click. Select the check box next to any issue to enable the Update option. Select the Update check box to update all the issues. You can also choose to update selected issue(s). Choose the desired option in Update, to update the issue(s) details. You can customize your view based on specific criteria. Feature Availability: Express, Premium, and Enterprise plans. Click on the current view and select Create Custom View. 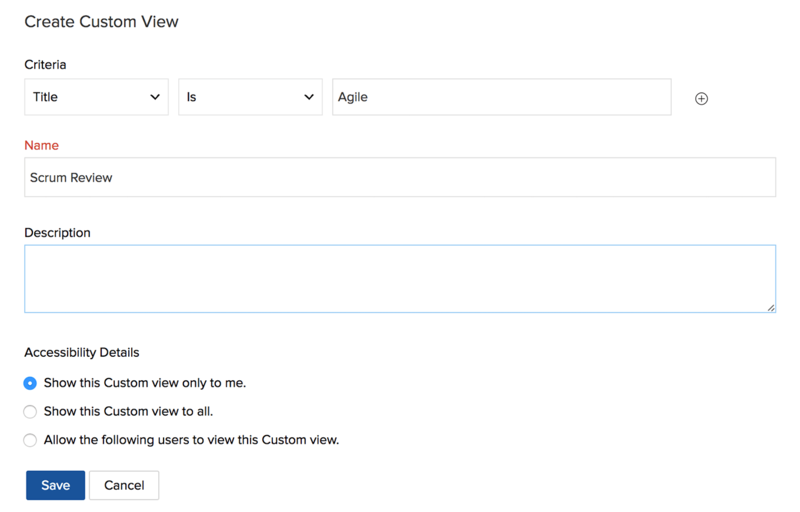 Set up the desired criteria to create the custom view. You can click to add more than one criteria. 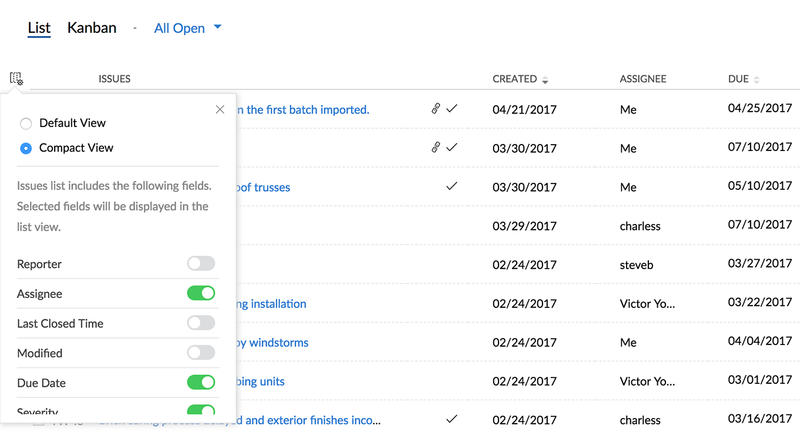 Specify other details to create the custom view. Click Save to save the custom view. Hover over the custom view to enable the edit and delete options. Select the required option. You can now save your filter selection to an existing custom view or save it as a new custom view. Select the required custom view. Choose the required filter options and select Find. If you click Existing Custom View, your filter selection is added to the existing custom view. If you click New Custom View, continue with the below instructions. Your filter selection is saved as a new custom view. Choose the required fields in Criteria. Click create a new criteria in the custom view. Enter the Name, Description, and specify the Accessibility Details. Click Save to finish creating the custom view. Favourite views displays the list of all your favourite custom and predefined views. Hover the mouse over the selected custom or predefined view to enable and then click to add that view to the Favourite Views. If required, you can unfavourite the view too.